An in-person interview with Patricia Stiles presents a remarkable experience, especially so for a non-musician as I am, as she talked about the singing techniques with demonstrations. At close-up, an opera singer’s voice is obviously very powerful, not so much in terms of decibels as to pierce your ear drums but with the power, vibration, and warmth that inspire and lift your soul. One finds it difficult not to marvel at how wonderful it is what the human voice can do. Though this kind of demonstration is impossible to get in writing but can be made understandable with articulation the way Patricia Stiles did. What is the good age to train voices for opera singing? Training in singing is like training on any musical instrument, you need to start very early. For men, there are boy choirs. Some of them train the singers very well to find freedom of air, of articulators like the tongue, the teeth, and so forth. Then when the boy’s voice changes, ideally he will be able to take over the basic habits of the technique he learned in choir and yet have a different range. But often the singers are asked to sing straight tone (without the naturally vibrant sound) and to make other compromises in order to blend with the other singers in the choir, thereby learning habits which can remain with them and can detract from the release of their free sound in the future. For young girls, it is different. Their voices don’t change incredibly much (until their hormones begin to change). So the ideal time for training girls’ voices for singing is in the teens, and well into puberty. If you think about students coming here to IU, the best and largest music school in the world, they almost never audition for the undergraduate program at the age of 17 or 18 if they haven’t had at least a couple of years of singing lessons beforehand. I studied piano from the age of eight on through my sophomore year of college. I also sang with an adult choir, which was full of graduate voice students, when I was a junior in high school and also with choirs at church and in school. I didn’t like practicing the piano, but the study taught me about many important aspects of music, and with the choirs, I learned how to read music easily and how to be exact. During my teens, I had no plans to become a professional singer. Yet singers need to learn these disciplines early, so the idea about studying the piano and other instruments that teach you musicianship as a young child is important. As a singer, one really needs to have good musicianship, since singers don’t mature as early as others musicians like violinists, and this can put you at a bit of a disadvantage. With good training and musicianship, is it possible to start opera singing at a later age? If you have always sung pop music and you start at 28 trying to sing classical music it is late – it is not impossible but it is very late. What are some of the pop singing habits that are not good for opera singing? In pop singing, people are often times encouraged to ad lib or change the rhythm and melody, for example in jazz tunes. There are places to do that in classical music but they are very restricted. In vocal music of the Baroque period, ornamentation of different kinds is encouraged, when a musical passage is repeated. But this type of ornamentation is governed by the accepted performance practices for that period. In the 20th century, 21st century music, sometimes the composer would put something down that says, “Just make this sound for a while,” but overall in classical music you are not encouraged to ad lib. The support, which the singer uses for classical repertoire, must allow the singer to sing a very long phrase so that every note sounds very similar, the sound is then said to be ‘even.’ I think that training for classical singing can be very advantageous for singing lighter music/pop/jazz. The support involves actually all of your body. These things need to be trained over time. Some people just know how to sing naturally, more by instinct, without much instruction. When they go into the classical field with this instinctual technique and something is demanded/expected of them, which they don’t know instinctively how to do, then these people may be in much greater trouble than those who have needed to study and struggle to learn how to sing well. Some characteristics of a good classical singing technique include 1. to have a very long breath line; 2. to have open resonances; 3. to open the inside of your mouth, your ears, your sinuses; 4. to have the muscles of your throat not encroaching on the larynx, etc. You learn these abilities when you have a good teacher and work on singing for classical music. And there’re many other properties and qualities too that somebody who’s only done pop singing probably hasn’t been challenged to do. For example in pop music you sing two words and breathe, two words and breathe. In classical music, what the singer does is much more prescribed. The composers have put it down on paper and the singer learns exactly that. Sometimes it is difficult, but the singer is learning vocal technique through instruction and also through trial and error to be able to have the long breath line, to be able to keep the space open, to be able to keep the vibrations even through the entire vocal range. Much of the control is accomplished through mental direction, not by doing something physical with one’s throat to make things work. There are many subtle differences in the singing of the styles—Renaissance, Baroque, Romantic, Modern, and these skills must be learned, although the vocal technique could be the same. So a well-trained opera singer is able to sing different kinds of styles? Ideally, yes. But when you talk about opera, are you talking about Monteverdi which is a long time ago, or Mozart, Strauss? Or Phan? People sometimes specialize. Some people are experts in singing the Baroque style; some people sing mostly vocal music from the Classical period; and other people sing music more from the Romantic and later periods. They all have different characteristics, and some people are better at one than the other. With all these differences and with all the possible repertoire choices, singers can be busy for their whole lives long. And the voice keeps developing. You learn some new things, you find the new release of your air and suddenly there is more space here, there is a louder sound there and that makes other things possible, especially in the growing period still when you are in your late teens, twenties, early thirties and forties. With a bachelor degree, is a voice student a professional yet? Not very likely. The bachelor degree covers the basics of singing and some foreign languages and their diction, some repertoire and then general education requirements. You get the beginning and then you graduate with a Bachelor of Music in Voice. There are a few people who can go on to be hired for young artists’ programs after that, but most people need the masters or at least two or three more years of study in singing, depending on how good the training or the teacher is, how interested or smart they are. So the bachelor is pretty much required, and the masters also pretty much recommended. After that, you’re not going to make a living wage. The voice is not going to be mature for any singer usually until after the mid or late twenties. An opera singer may reach his or her peak between the ages of 35-45. There are present day opera singers, who are still singing well on the international stages at the age of 70-75. When a woman gives birth to a baby, the voice probably changes. Then you have to rethink: What voice type am I now? Or when you get older, oftentimes in the thirties, the voice matures. If you’re singing well, you’re using the muscles more and more they get to be stronger and they can do bigger and louder parts. Then the question is: Do you want to keep growing and changing and see what your voice can do, or are you satisfied with where you are and you plan to continue daily vocal maintenance for the rest of your career. Either way, you must sing regularly, probably daily throughout your vocal range with exercises for range, flexibility, legato, etc. Some people want to continue developing out of curiosity or advice from others. As the voice matures they can sing full lyric or spinto soprano roles, or lyric or heavier tenor roles or dramatic mezzo or baritone roles, for example. In a way, that is a positive development because as the voice grows, generally there’re fewer people who can do those kinds of roles. So when you are able to sing Spinto roles (which need a stronger brighter Italian type of sound) like Madame Butterfly, or you go into singing Wagner roles or other roles, which demand very strong carrying power, which can soar over a larger orchestral sound, then, as I said, there are fewer people doing those things. But lots of voices can’t develop that far and shouldn’t try to. Some people have trained to become expert in exactly what they were doing and they want to keep doing just that. That is the singer’s own decision. Is versatility an advantage that can get the singers more chances? Not necessarily. In America, we want to believe this. I sang in Germany for 20 years, and I believe the system there prefers singers who can be easily categorized as to voice type. What a singer does in singing is a very physical thing; it is not like pianist who may play mostly lighter repertoire in the beginning then then take on more mature music later on. A singer cannot cover a wide range of voice types. But sometimes it does happen that a singer develops to make it possible to move into ever heavier repertoire. I went from singing very light soprano repertoire, such as the soprano solos in Handel’s Messiah and Haydn’s Creation to singing Mozart operatic roles as a soprano and as a mezzo soprano and then moved through roles such as ‘Octavian’ (Richard Strauss’s Der Rosenkavalier,) ‘Carmen’ (Bizet), ‘Preziosilla” (Verdi’s La forza del destino), ‘Eboli’ (Verdi’s Don Carlos) to singing Wagner roles myself. I was one who was curious and wanted to keep on trying new things, perhaps because I started later. When I went over to Europe I was already over thirty. By the time I was forty, I needed to ideally do things besides the pants roles (the lighter to medium mezzo roles such as ‘Cherubino’ in Le nozze di Figaro, or ‘Hansel’ in Hänsel und Gretel.) And because of looks, it was nice to go on and sing the parts of more mature people. I wanted to try that so I did and I kept developing until I was able to successfully sing Wagner roles such as ‘Ortrud’ in Lohengrin and ‘Erda’ in Das Rheingold. As singers, we sometimes make these choices. Deep support is important in opera singing. What do you teach your students? Some people support in other ways but I think deep support is important. I feel my support from the feet up and especially in the trunk of the body. I work with the students on the use of the abdominal muscles. I teach the relaxed intake of the breath and the phonation on the outgoing air while finding a firmness/resistance in the body, which keeps the tone vibrant and focused. I believe that the engagement of the soft palate plays a very important role in encouraging forward placement of the tone, which, when forward, feels much easier to produce. This method can feel just as if the singer releases the sound. There are different schools of how to breathe for singing, and there are probably successful people in every school. What is it about our voice that allows us to have good projection? I am not a scientist to explain projection from that viewpoint. 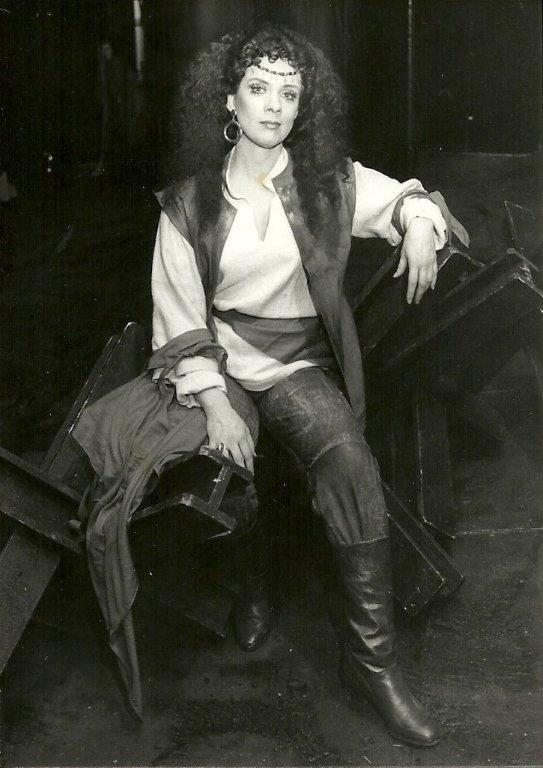 I would say what allowed me to be able to sing Verdi and Wagner roles and to carry over the orchestra was that I learned to use my whole body, which is not very big compared to most opera singers, to use my air, and my resonances in a way that made my vocal tone have a very strong core and lots of high overtones. And that core and brightness combined translated into carrying power which was able to cut through the orchestra. What types of voice can be trained to sing opera (without using a microphone)? A good, strong voice – the type of voice that has flexibility and a combination of strong core with depth and brightness. A good singer needs a good mind, healthy body, strength of character, acting ability. On the stage, your personality is the servant of the character you are trying to portray. A lot of it has to do with how you think about it. You have to be able to tune in to your power as a person, to your feelings and empathy for the character in order to communicate and to reach out to your audience to make them feel something. What is the maintenance schedule for an opera singer? I did all these interviews with opera singers who have been singing professionally for over 30 years, and almost all of them said that they do some sort of maintenance practicing, warming up and such, exercising their voices, almost every day. Some people didn’t do that, but then, when it came time for them to sing again, they had to allow a longer time to get ready because the muscles forget things and they get weaker and less flexible and lose their stamina. But the maintenance has to do with physical fitness too. You have to be strong enough to stand there and sing tones that go over the orchestra; you have to understand something about the core in your sound even if at the instinctual level only; you have to be planted so that your body becomes a fulcrum while the vibrating air shoots through you and releases into the hall as sound. You become a conduit for the sound. ***** The Vietnamese version of this article has been published by the Vien Dong Daily News, also available online here. Please wait for a response from Prof. Stiles.